Yo! Ue is having an amazing season getting lots of photos in the magazines, and now he has a cover! He did not even have to snowboard for this one! You know you’re doing good when you get a cover by just walking in the forest. The cover of the new Honeyee.mag out now! I took this picture in March of this year near the top of Nakayama pass. We were hiking around looking for something to do. I love the Japanese Shirakaba trees and the light was really nice. 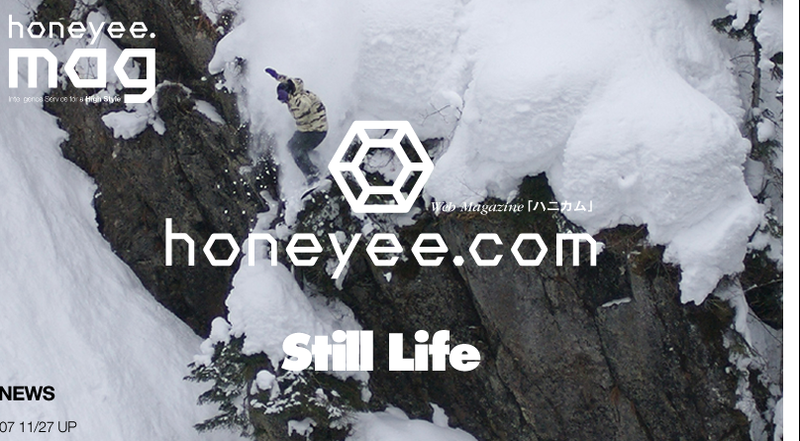 I have only seen this image on the honeyee.com web site looking forward to checking out the magazine. From what I hear, I have more photos in the magazine! 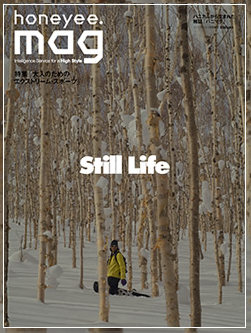 The issue is called Still Life and it is focused on extreme sports for grown ups! Try and find a copy at your local book store quickly as they sell out fast!! 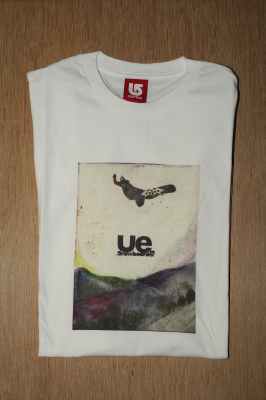 UE_snowboarder limited edition T-shirts go on sale at HMV. A special collaboration between Burton, One Films and HMV brought about this T-shirt. Ue picked out the T-shirt style (slim fit) and Burton did a great job on the printing of the package artwork. Stop by HMV in Tokyo to pick up one of these shirts, then go to your nearest snow area and ride, ride, ride! If you are not in the Tokyo area you can pick one up on the web like everything else these days! Click here. The North Face outdoor meeting was held in Tateyama last weekend. I was there four times over the last two years, but could not go to this meeting! Well, apparently I totally missed it! 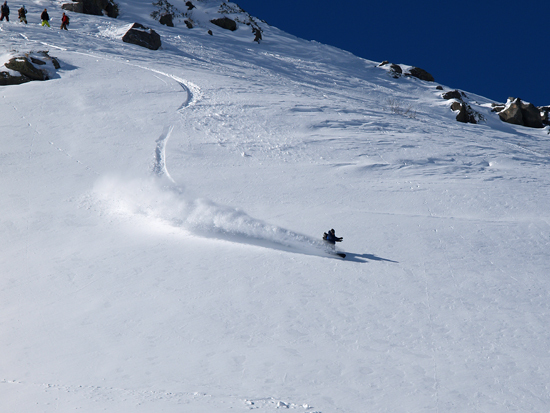 Blue sky and powder everywhere! Check out this photo I received from my friend Quezman. Now go and take a look at MSR blog for more photos like this one of Masa Takeuchi! Unbelievable…. how could I have not been there…. and I call myself a professional…. ahhhh. Thanks for the photos guys, good stuff! Amazing, unbelievable, it could not be true, this could never happen in Japan! Those are a few of the thoughts that went through my head when I saw this magazine. Obviously I knew it was going to be released as the editors asked me for some photos… but I did not expect such a high quality magazine. This is a great day in history for Japan. 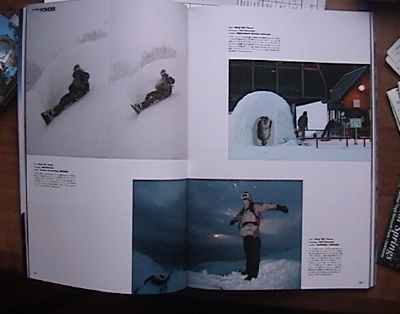 Photo issues are very common in the US and Europe, but here in Japan in snowboarding it is unheard of. 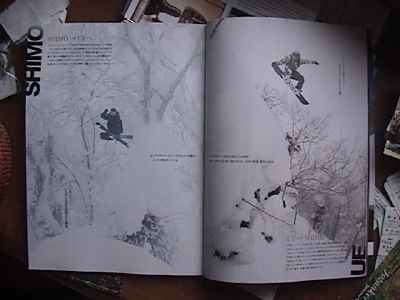 Magazine staff are convinced that Japanese consumers will only buy magazines filled with lessons on how to ride better. Let’s all prove them wrong by going out and buying this magazine, because if we don’t, it might never happen again! Even if you don’t read Japanese you will enjoy this magazine, the pictures are all great and there is a lot of stuff in there. The worlds top cameramen and Japan’s best all contributed to this piece. It is an honor to be placed along side the best in the business. If you do read Japanese, check out the good interviews with Blotto, Yoshito, and Tochi-san. Here is a look at the stuff I have published in there. Now please go out and pick up a copy! Or buy right here via the web. 日本、アメリカ、ヨーロッパ、ニュージーランドなど、常にさまざまなエリアを旅しているフォトグラファーとライダー。世界中で撮影されているスノーボードの写真の数だけ、作品として仕上がるまでのストーリーがある。世界各国のフォトグラファーとライダーが写真でスノーボードを表現する渾身のフォトスペシャル。 At the end of the magazine there is a nice section of short interviews with all the cameramen. Some new magazines have been released in the last week and I have a few photos published. 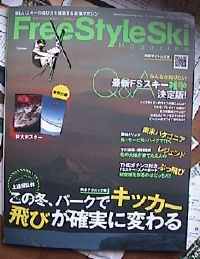 First is Japan’s “Freestyle Ski Magazine”. I shot all the photos and helped write the story on this section. It is a comparison and session between Uemura Yoshinari and Shimomura Motoki. 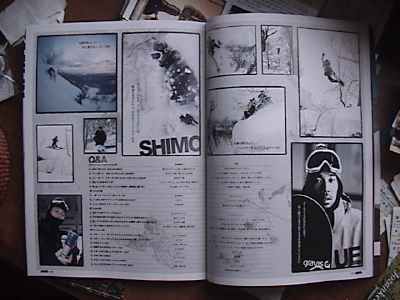 Ue the rider and Shimo the skier. We rode and shot together in Asashidake last spring and it was a good learning experience for everyone. 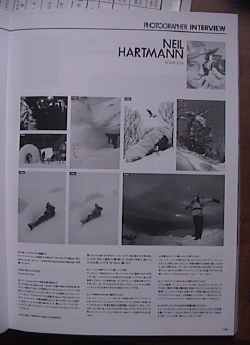 If you are into skiing, you should definitely check out this magazine. Some of the international photos in the mag are incredible, I don’t understand how someone can jump that high out of a halfpipe! Inspiring stuff! The long awaited movie MASH has arrived in the mail today from San Francisco! When Hiroshi showed me this movie about a year and a half ago in Tokyo, it freaked me out! Guys riding track bikes with no brakes down SF hills and doing crazy freestyle maneuvers. It was like the first time I saw a snowboard video. I got so excited…… but I have yet to buy a track bike! Now it seems everybody I know is into it. Even here in Sapporo all the snowboard crew have bikes and that is all they talk about. Maybe when the snow melts I will have to think about getting a bike. In the meantime will be watching MASH tonight. The DVD comes in a really cool art book package. Great photos and culture. Check it out. Here is the MASH blog and here is the MASH web site. So yesterday was the best opening ever at Kokusai Snow area. They are celebrating their 30 year anniversary this year, so mabye the snow Gods decided to help out! Check out some of these pictures from my video footage yesterday! Today the temperature was a little warmer, but still snowing at Kokusai. In the afternoon the weather was clearing to a nice evening. Beautiful full moon tonight!There was another Avalanche accident in Tokachi yesterday. Three people injured and one dead. Very sad start to the year. Everyone please be-careful when heading into the mountains especially this time of year.